These instruments are complemented by an impressive collection of pulsating pads and atmospheric soundscapes which evolve over longer periods. These unique sounds ensure that Dark ERA can clearly be regarded as the next masterpiece created by Eduardo Tarilonte. 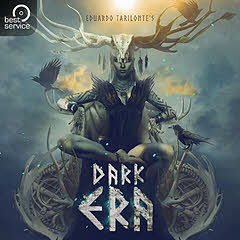 Dark ERA offers more than 50 instruments consisting with over 20,000 samples. The library contains seven string instruments, 17 wind instruments and 33 drums and percussion. In order to maximize playability, several play techniques have been recorded and made available in the library respectively our powerful cross-platform compatible sample-player Engine. The wind instruments offer different articulations as well as true legato. In addition, the flutes provide some really unusual and haunting effect sounds. Furthermore, the string instruments offer round robin samples for notes being picked in up and down directions. The plucked instruments were recorded with different play techniques such as using a plectrum, fingers or being strummed. - Bowed Strings: Tagelharpa / Jouhikko Small, Tagelharpa / Jouhikko Big and Crwth. - Plucked Strings: Cologne Lyra, Ancient Lyra, Sutton Hoo Lyra and Utrecht Lute. - Winds: War Horn, White Horn, Curved Horn, Shofar, Bukkehorn, Shell, Long Trumpet, Big Horn, Double Flute, Small Bone Flute, Vulture Bone Flute, Pictish Pipes, Elderwood Flute, Overtone Fujara, Didgeridoo and Wooden Lur. - Percussion: Shamanic Drum Small, Shamanic Drum Big, Big Frame Drum, 5 Square Drums, 2 Skin Drums, 2 Skin Snares, Skin Tom, Sieves, Anvil, 3 Viking Mouth Harps, Jawbone, Pan Medium, Pan Rusted, 7 Seed Shakers, Small Bells, 2 Cowbells, Bullroarer, Horseshoe and Bronze Mortar. The instrument collection is complemented by more than one hundred programmed soundscapes. These are partially rhythmically animated to pulsate in sync with the current tempo or to create unreal atmospheres using complex sound textures. These textures consist of several elements which can be adjusted in level and panning to your liking in the mixer page of Engine. To support the sound rhythmically, dedicated Epic Loops have been designed. These consist of up to 20 instruments and up to 16 separate elements which can all be individually adjusted, allowing to flexibly arrange beats. Available are four variations for each main loop, different fills and endings (ensemble and single hits) as well as a pulsating sound matching the rhythm. The loops will automatically adapt to the tempo of your DAW. The rhythmic pads containing melodic as well as rhythmic elements gap the bridge between drums and solo instruments. Just as for the soundscapes, the individual pad elements can be individually be panned and mixed. Another specialty of Dark ERA is the vocal section. Vocal rhythms, being inspired by the Inuit, can be constructed and arranged from single notes. 24 MIDI-files serve as templates which trigger and play the individual shouts. Of course, the rhythms can be edited or even be created from scratch. The throat singing recordings have been divided into four styles. It is also possible to add harmonics using a dedicated slider. Shaman ritual chants and sole vocals add liveliness and authentic elements to the music. This library is the perfect instrument for movie soundtracks and television documentaries covering corresponding topics. At the same time, the library is equally suited for historical music productions as well as for ambient music. In addition, it provides suitable stylish background music for games within this setting.